Jakarta. Indonesia and Panama agreed to conduct their first ever bilateral consultation meeting soon to address various issues, ranging from visas to maritime cooperation, as part of efforts to boost relations, the two counties' foreign ministers said in Jakarta on Thursday. 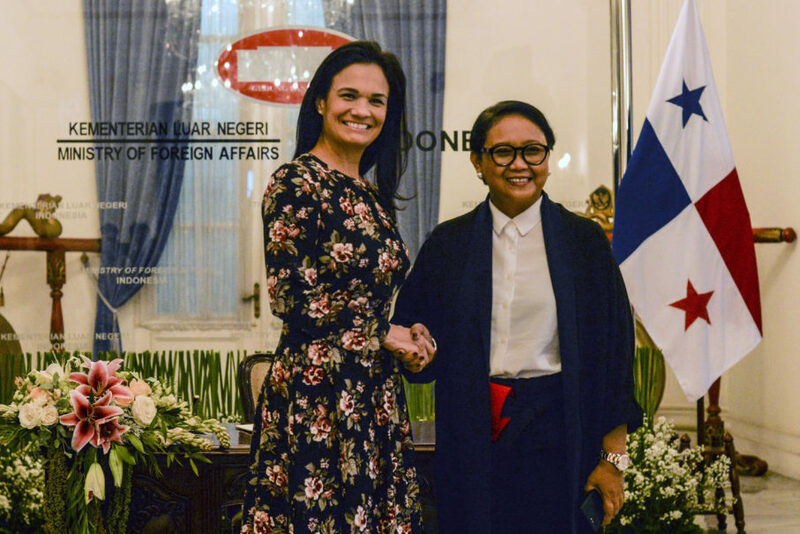 "We are sure that with the expanded team that will accompany the foreign ministers when these political consultations take place, we will be able to move forward with these agendas," Indonesian Foreign Minister Retno Marsudi and Isabel de Saint Malo de Alvarado, vice president and foreign minister of Panama, said in a joint press statement. This is the first visit of a Panamanian foreign minister to Indonesia since the establishment of diplomatic relations between the countries in 1979. Retno and Saint Malo de Alvarado discussed ways to strengthen bilateral relations, with economic cooperation as one of the main priorities. Two-way trade between the two countries rose to nearly $130 million last year, with a surplus in Indonesia's favor. Retno said the more than 31 percent increase in the volume of bilateral trade between the two countries in the first half of thi s year shows tremendous potential. More than 60 percent of Indonesia's exports to South America pass through Panama due to its strategic position as a gateway to the Americas. This could boost Indonesia's efforts to tap nontraditional markets. "When you look at Panama, you're not really accessing Panama; you're accessing all of the Americas," Saint Malo de Alvarado said. She added that stronger ties between the two countries would help Indonesia reach markets in South America, North America and the Caribbean. The two ministers also covered other areas of cooperation during their meeting, including on maritime affairs, port management and the development of exclusive economic zones. "Some maritime cooperation areas we intend to pursue include enhancement of human resources capacity in the maritime field and certification of Indonesian seamen," Retno said. She highlighted the importance of making it easi er for Indonesians to obtain Panamanian visas, as part of efforts to advance people-to-people relations. The ministers also agreed to improve channels of communication between the two countries, to boost their respective creative industries, and to promote commercial exchanges. Saint Malo de Alvarado attended Trade Expo Indonesia 2018 in Tangerang, Banten, and she is set to participate in the upcoming Our Ocean Conference in Bali next week.